Thank you gifts for those people who make the bride and groom’s day special. Accessories for the bride’s hair, in some cases replacing the more traditional veil. Use a single rose to mark the seats of both the groom’s and the bride’s mothers. Use the bridesmaids’ bouquets to create lavish buffet table decorations or to surround the cake. Talk to your florist about these ideas for your wedding flowers. ESPECIALLY YOURS FLORIST located at 670 Washington st, S. Easton, has received an Award of Quality Achievement from BloomNet®, one of the floral industry’s leading wire service providers. The award, which is part of BloomNet’s Florist Quality Care Program, recognizes ESPECIALLY YOURS FLORIST for superior quality floral products and excellence in customer service. The BloomNet Florist Quality Care Program was developed with extensive input from florists throughout the country as well as through the expertise of a Quality Care Board consisting of highly successful florists representing more than 200 years of experience in the floral industry. The Program is monitored by florists and it includes stringent quality and performance standards that must be continually maintained in order to be considered for Award recognition. Among the Program’s criteria are: using only the highest quality fresh flowers in all orders; employing well-trained and skilled design and sales personnel; providing the highest levels of service and responsiveness to customers; and always striving to assure that outgoing and incoming floral wire orders are fulfilled to the complete satisfaction of each customer and recipient. Prom season is here and at Especially Yours Florist all our corsages and boutonnieres are custom designed to match the dresses and tux’s. Please try to bring in a swatch of fabric so we can match up flowers and ribbons to set off the color and style of the dress. Feel free to spend a few moments with our designers so we can give you that special look! Here is an example of current trends in wristlets. Please visit us at www.especiallyyoursflorist.com to see more. I just came across the following article on a floral website and thought it was a timely post that I could share. It was written by Jenny Scala on a SAF blog. The first day of school is a milestone no matter what grade your student is entering. On the big day, you’ll snap photos of them clutching a new backpack and wearing new school clothes before sending him or her off. You’ll proudly share those photos, post them on Facebook, and look back at them fondly in years to come. The first day of school can be both a time of excitement and trepidation for your child who has a new teacher, new classmates and a new routine. Start the day with a fun, memorable tradition — give flowers to your child. Flowers are a great way to celebrate the milestone, and can help ease those first day jitters and send your student off with a smile. Research proves being around flowers makes you happier and more energetic, especially after looking at them first thing in the morning. Who wouldn’t want those good feelings on the first day of school? Kindergarten through Early Elementary School student: A single flower will make your young student smile and feel extra special on their first day of school. 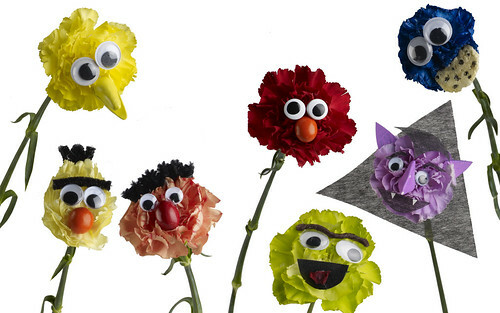 You can even dress up the flowers in their favorite characters, like these Sesame Street carnations. THE BETTER DEAL IS THE LOCAL DEAL! WE DELIVER FLOWERS LOCAL AND WORLDWIDE! ESPECIALLY YOURS FLORIST has received an Award of Quality Achievement from BloomNet®, one of the floral industry’s leading wire service providers. The award, which is part of BloomNet’s Florist Quality Care Program, recognizes ESPECIALLY YOURS FLORIST for superior quality floral products and excellence in customer service. I would like to share this recent article from SAF (Society of American Florist) on the “power of flowers”. Scientific research proves that receiving flowers and being in the presence of flowers make people happy. But is it better to give than to receive? Through a partnership, SAF and the American Floral Endowment commissioned a Rutgers University study in 2006, to determine how people perceive others based on the types of gifts they give. The results are groundbreaking, as flower givers rose to the top. The research reveals that people who give flowers make the best impression compared to other gifts studied. They are considered more likable, friendly and emotionally intelligent. The floral gift-giver is regarded as highly caring, trustworthy, loving, successful, and as valuing achievement and beauty in life. Through a strategic public relations campaign, SAF is alerting the media to the Power of Giving Flowers to keep flowers and florists top of mind among consumers. SAF launched the campaign in Spring 2008 to generate print and broadcast media coverage of the flower message. Lead researcher Dr. Jeannette Haviland-Jones acts as spokesperson to explain the study’s findings. Inspirational author and executive coach MJ Ryan, who helped create the “Random Acts of Kindness” series and wrote books on gratitude and giving, presents the floral gift-giving advice through top 10 occasions and people-to-impress lists. SAF is distributing broadcast packages to TV and radio stations nationwide, a press kit to national and local print media, targeted outreach to key media, and 24/7 coverage on SAF’s consumer Web site, www.aboutflowers.com. Combined, the PR tactics work together to infuse the floral message in the context of everyday news. FLOWERS BRING SMILES. Of 147 Women of varying ages, those who received flowers smiled significantly more than those who received fruit and sweets or a candle. A SINGLE BLOOM CREATES TALK. Another study took place in an elevator where a single flower was handed to a man or woman. Both women and men who were presented with a flower (rather than a pen or nothing) were more likely to smile. They were more likely to stand at a social distance (rather than an impersonal one) and were more likely to begin conversation. BOUQUETS BEAT DEPRESSION. Retirees, whose average age was 73, were asked to keep a diary of daily social interactions. Those who received bouquets were happier and perhaps less depressed than those who did not, and they scored higher on memory tasks. Let’s help. Let’s help fight depression. Give fresh flowers to bring smiles!